This title examines the institutions of the Church and explores the significance of the sacraments, with over 180 photographs. 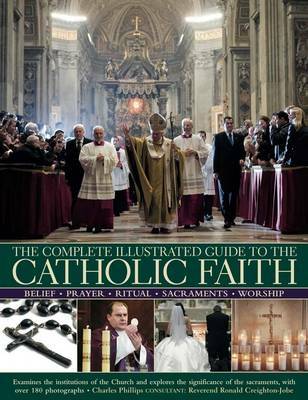 It offers an introduction to the traditions of Catholic ritual. It describes the administrative structure of the Church, and also examines the duties performed by different sorts of nuns and priests and the vows they take. It explains the seven sacraments. It features a guide to the festivals and holy days in the Catholic calendar and the customs associated with them. The Catholic religion has a spiritual, cultural and historical heritage that spans more than 2000 years. The first part of the book explains the hierarchy and structure of the Church, from the Pope who provides guidance to the bishops in their dioceses, to the priests in their parishes. The seven sacraments of Baptism, Confirmation, the Eucharist, penance and reconciliation, the anointing of the sick, holy orders and Holy Matrimony are all described. Finally, important days and festivals in the Catholic calendar are discussed, such as Lent, The Resurrection and Easter. This title is lavishly illustrated with more than 180 photographs and fine-art paintings.